Concrete is an ingredient utilized for rocket silos, refined concrete, artillery turrets and facilities relating to nuclear material (reactors and centrifuges). 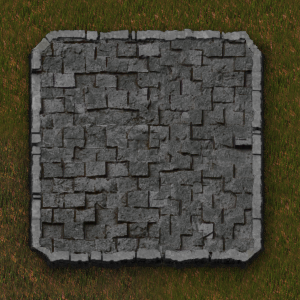 Concrete serves as path with more advanced bonuses compared with stone bricks. Concrete increases walking speed by 40% and decreases vehicle rolling resistance, allowing for extra acceleration and top speed, although each vehicle is affected differently; the tank is only affected by a 20% bonus, for example. Concrete has no effect on the movement speed of enemies. Concrete is placed using Left mouse button and can be removed by using Right mouse button while holding any kind of path. The area in which concrete is placed can be increased and decreased by using PAD + and PAD -. Placing it over another type of path automatically mines the previous path. Placing stone or concrete floors will remove bushes. This page was last edited on 26 January 2019, at 06:46.